We’ve reviewed Knez Winery before. They were a major find on our jaunt to the Anderson Valley. Now they’re offering a year end bargain that’s hard to resist. Their 2013 Anderson Valley Knez Reserve pinot noir is made from a vineyard located between their Cerise and Demuth Vineyards. Regular price from the winery is $59 per bottle. Right now this lovely wine is on sale for half price. At $29.50 this is what you need for your holiday celebrations. We bought six bottles, drank one tonight, and can recommend it without any reservations. Available in the greater Silicon Valley area, we took a chance on this one and were richly rewarded. This is a major bargain at $7.99 a bottle. And the wine has the notable characteristics of the fairly new Arroyo Seco AVA. 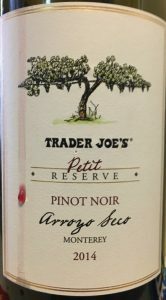 This is our mini-review of Trader Joe’s 2014 “Petit Reserve” Arroyo Seco pinot noir. The wine opens with aromas of black cherries, leather and dust. The palate begins with an explosion of gooseberries and cherries followed by a long finish with bright acids. We think of Arroyo Seco as Santa Rita Hills with a bit more rain. Both have the characteristics we call simply “desert.” There’s always a hint of sand and dust in there. If you want an introduction to the Arroyo Seco AVA, this wine is for you. We occasionally buy some wine at Trader Joe’s. But we recently discovered two that are amazing bargains. Each is $7.99 per bottle. You will not find better deals on wine anywhere. This is the story of two bargains from Trader Joe. Here’s the scoop: floral and honeysuckle aromas followed by passion fruit and an amazing orange blossom flavor. There’s a hint of lime on the finish. Viognier, like pinot noir, is very susceptible to terroir and winemaking technique. We find most of them overbearing with too much of the natural honey. Not this one. And a few days ago I brought home a couple of experimental bottles of pinot noir. We’ve only tasted one — and Norma sent me back the next day to pick up a case. The wine is from New Zealand. 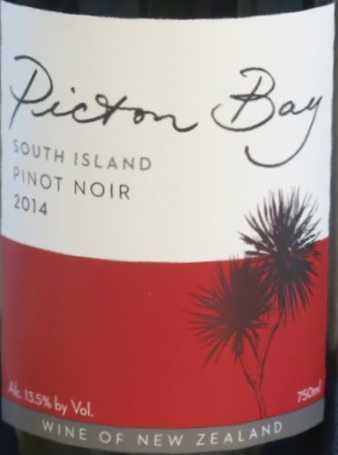 The Picton Bay South Island 2014 pinot noir is light enough to be a summer wine. Aromas of red raspberries and cherries are followed by more raspberries, tart cherries, and a hint of spice. Light enough to support what might otherwise be excessive acidity. According to Wine Searcher, Picton Bay is the export label for the highly regarded Mt. Riley winery in Marlborough. It looks to me like this label was created specifically for the U.S. market and (perhaps) exclusively for Trader Joe’s. 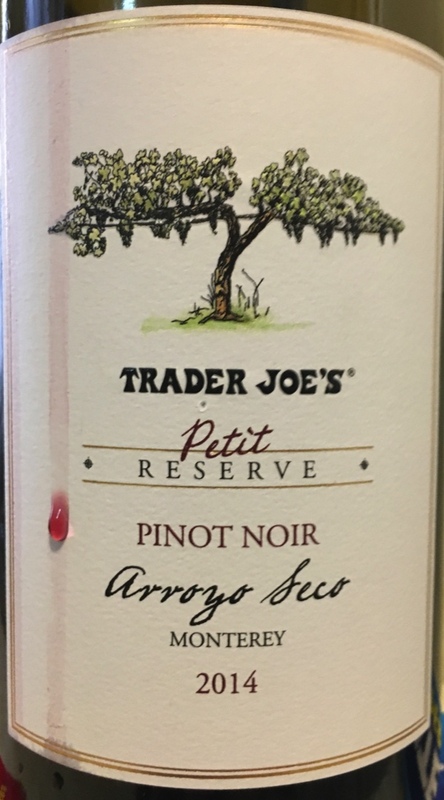 Trader Joe’s generally gives store managers considerable latitude in choosing non-TJ’s wines. You can probably find the Honey Moon almost everywhere. I know the Picton Bay is available at the Trader Joe’s on Homestead Road in Los Altos, CA. After a tasting at Artisan Wine Depot, we were shopping the pinot noir aisle. On a whim we picked up a bottle of Luli 2012 pinot noir. We were very lucky. Luli wines are welcome additions to the fine pinot noir category. Luli Pinot Noir 2012 (Santa Lucia Highlands, Monterey County, California). Bought at Artisan February 12, 2014. Aromas of sweet cherries, rose petals and leather. Black cherry palate with a hint of licorice. Long finish with silky tannins. A bargain at $20. The winemaker is Jeff Pisoni. So who are the geniuses behind Luli? Well, the winemaker is Jeff Pisoni. That last name should tell you a lot about Luli’s credentials. We live wine. We are a master sommelier, grapegrowers and winemakers. Our partnership—Sara Floyd and the Pisoni Family—came together from different aspects of the wine business. Sara is a Master Sommelier, the owner of Swirl Wine Brokers and has a long history in wine and restaurants. The Pisoni Family is known for its eponymous vineyard in the Santa Lucia Highlands and for Pisoni Estate and Lucia wines. Deciding that we would make a great team and noting the shortage of handcrafted wines at reasonable prices, we set out to create a new line of wines that you would love, at prices you can afford. We seek high quality fruit and craft exceptional wines. The Luli wines are made from vineyards in or near the Santa Lucia Highlands. Our goal is to showcase the beauty of our region with wines of consistent quality. We source and purchase grapes from lifelong friends in the area, and are therefore able to maintain a close eye on the farming. The wine production, aging and bottling are done entirely at our own winery. We thoroughly enjoyed tasting Pali’s wines in June, so when Artisan Wine Depot invited us, we jumped at the chance. On the Saturday before Christmas the store was busy, but we were patient. OK, no we weren’t. Joanie Hudson (Pali’s Western Regional Sales Manager) was as charming as she was in June. 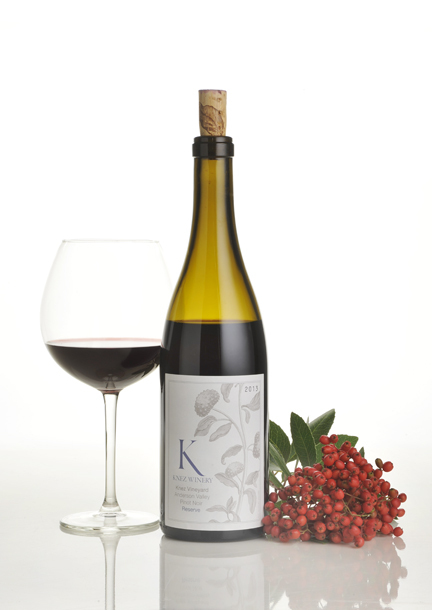 The first pinot was the 2011 “Shea Vineyard” (Willamette Valley, $54.97). We’ve tasted a number of wines from this vineyard in the past and, frankly, it’s appeal has always escaped us. This was no exception. The wine is thin and acid with no mouth feel at all. The next pinot was the 2010 “Riviera” (Sonoma Coast, $16.99). “Juicy” is the best word I can come up with to describe this wine. Black cherry aromas are followed by blackberry flavor with a hint of chocolate. We bought two bottles. Interestingly, we also tasted this wine in June. It’s difficult to believe it could have improved so much in six months, but apparently it has. Up next was the 2012 “Huntington” (Santa Barbara County, $19.99). Aromas of black cherry and blackberry with a hint of earth. On the palate, flavors of blackberries and plum. This was our second choice. Both the Huntington and the Riviera are genuine bargains. The 2010 “Windsor Oaks” (Russian River Valley, $44.99) presents aromas of white pepper and oak. At the moment, the wine is too oaky and tannic for us, but those with the patience to wait three or four years will be rewarded. Winemaker Aaron Walker (previously assistant winemaker under Loring), in conjunction with consulting winemaker Kenneth Juhasz combined efforts starting with the 2008 harvest. Walker and Juhasz are terroir specialists who strive to bring out the distinct characteristics of each of the sites we source for our fruit. The 2012 “Bluffs” (Russian River Valley, $19.99) presents aromas of earth and is generally a more austere. This is a straightforward pinot noir with no pretensions. On the palette, lush tannins give way to red fruits. Friday we visited our friends at the Artisan Wine Depot in search of pinot noir. James informed me that a few 2012 pinot noir vintages had arrived. Specifically, he recommended the Siduri Russian River Valley blend and the always-reliable Sean Minor Four Bears. He also gave a rave, two-thumbs-up, review of the 2012s generally. This is our early look at the 2012s. In a few words, James is correct. 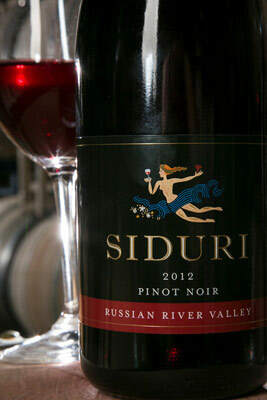 The Siduri has powerful aromas of cherry and rose petals, followed by a delicious mouthful of pure fruit. A bargain at $27 (Artisan price). The Sean Minor is less complex with minerality overlaying the fruit aromas. The style is lighter than the Siduri, tending toward raspberries. And it’s only $12. 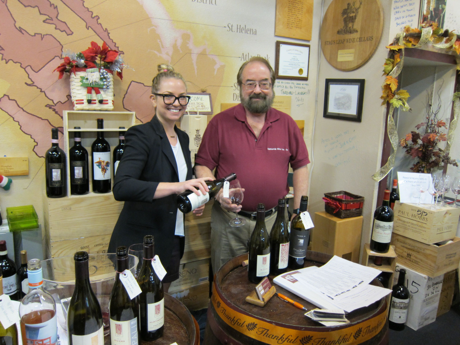 Our favorite local wine shop, Artisan Wine Depot, hosted a tasting of Pali wines on June 21. We hurried over in anticipation of a delightful event. We were not disappointed — Pali put together an interesting, varied selection of two chardonnays and seven pinot noirs. Here we’re only going to review our four favorites among the pinots. Hosted by the delightful Joanie Hudson (Western Regional Sales Manager), the setting was the tasting room at Artisan. We were pleased to see that the sales counter at the front of the store was mobbed. What’s good for them is good for us. But we’re here to talk about Pali Wines at Artisan Wine Depot. The two chardonnays were both 2011 Sonoma Coast varietals. The “Charm Acres” ($21 but sold out according to the website) opened with delightful, unexpected roasted pear aromas. The grapefruit-citrus flavors served as a palate cleanser. The “Durell Vineyard” ($30 according to the tasting notes) opens with aromas of ripe melon, followed by honeydew and pineapple. The first pinot was the “Riviera” 2010 Sonoma Coast ($21). The color has brownish tints, but that should not put anyone off. This is good stuff. Aromas of damp earth, forest floor and mushroom. Concentrated ripe black berries explode on the palate, moving into nuances of fresh raspberries. A long, amazing caramel – butterscotch finish closes the show in spectacular fashion. The “Summit” 2011 Santa Rita Hills ($29) begins with aromas of fresh crushed raspberries, and nuances of white pepper. Flavors feature more white pepper, limestone and minerality. The “Bluffs” 2011 Russian River Valley ($22.50) presents aromas of earthy mushroom, black cherry with nuances of cedar. This is a straightforward pinot noir with no pretensions. On the palette, lush tannins give way to red fruits. The Pali website has an unusual organization. To find 2011 vintages that are not single-vineyard designates, click here. For single-vineyard wines click here. There’s an Elk Cove bargain for bay area pinotphiles at Artisan Wine Depot in Mountain View. Elk Cove 2009 Willamette Valley pinot noir is on sale for $19.99 a bottle, about 1/3 off regular retail. At that price it’s not just a bargain — it’s a steal. Aromas of strawberries and brambleberries, with an explosion of red plums on the palate and a long mineral finish with silky tannins. Great stuff, highly recommended. We ran across Elk Cove during our two week Oregon trip last summer. When we saw this one on sale, we jumped at the chance. Artisan will ship to other states, so don’t be shy. Get it while you can!